For the week of October 21-27 Dane Reid Media will be honoring Breast Cancer Awareness month by donating a portion of its earnings to the Susan G Koman Foundation for a Cure. We have all been affected either personally or through a family or friend who has suffered with cancer. Through education, technological developments and early detection, survival rates have risen. 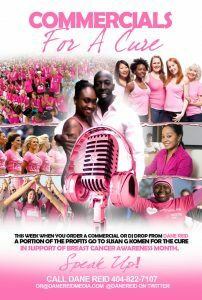 This week when you order a commercial from Dane Reid, a portion of the profits will go to Susan G. Komen for the Cure in support of Breast Cancer Awareness month.